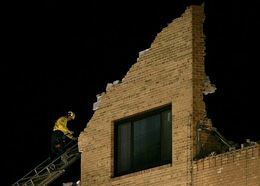 A firefighter at the scene of a collapsed building in downtown Clinton, Mo., where several people were rescued in June last year. Initial on-scene units should be directed in rescuing victims that can be seen on the surface and it's vital that rescuers are aware of all the physical hazards present at the scene of a structural collapse. It's at this time that Command should order a situation report from area officers. Members previously operating in the collapse structure should be quickly debriefed as to building lay out and possible location of victims. After all personnel have been removed from the collapse site, Command should establish structure triage teams. These may include structural engineers and/or personnel that are specifically trained in the recognition of structural collapse. If a victim is located, the rescue team should treat the area that they've been found in as a confined space and followconfined space rescue operations guidelines. The rescue team leader should designate the proper method of entry into the space and ensure the safety of the entry rescuer. All spaces must be monitored for flammable, toxic and oxygen deficient atmospheres before entry is made. Prior to beginning general debris removal, Command should call for a situation report to establish victim survivability — remember life is lived by the rule of 3's; 3 minutes without air, 3 days without water and 3 weeks without food. If it has been determined that no victims can be found alive in the building, a general debris removal can begin. Should there be a potential for deceased victims to be trapped in the rubble, removal crews should be alert for signs of them.